Coalition of Black Students hosts highly-attended campus event. Photos by Lórien MacEnulty. Students flooded into the Reading Room at Cowles Library Thursday evening for the Coalition of Black Student’s (CBS) bi-annual event. This semester, CBS held “Bulldog Testimonies: Living in 45’s America,” which included a panel of five students, moderated by Drake law, politics and society professor Will Garriott, discussing how the Trump administration has impacted them. 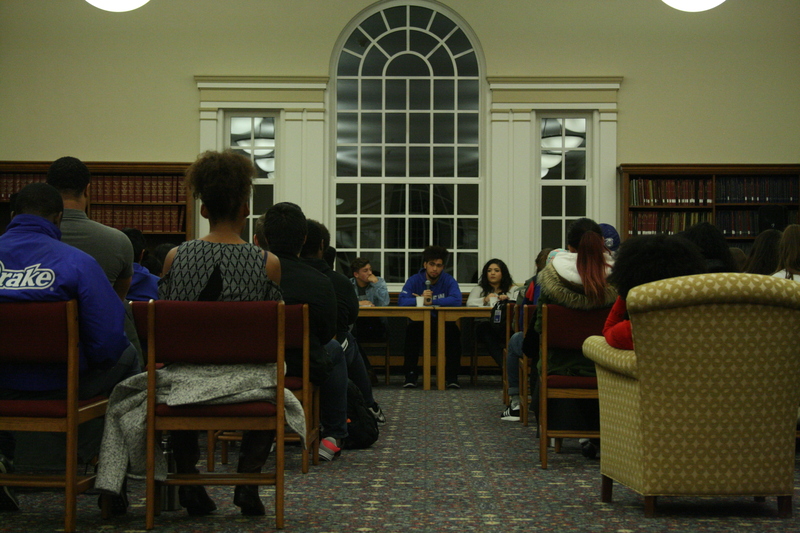 The panel featured students from different groups across campus as well as different majors and different lifestyles. 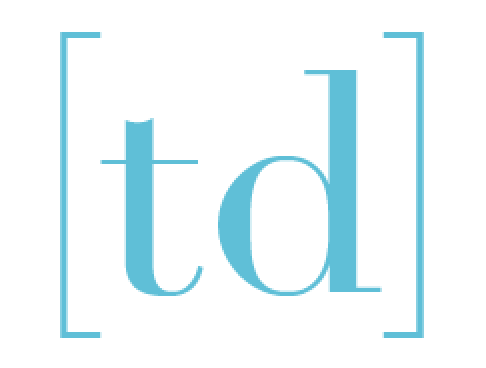 Phoebe Clark, a self-identified genderqueer student studying rhetoric and law, politics and society represented the group Student Activists for Gender Equality. Itzayanna Rubio from La Fuerza Latina spoke about living in America as an undocumented immigrant until only recently receiving citizenship. Will Whitaker from CBS spoke about his activism on social media and in other protests. Kollin Crompton, a student studying politics and identifying as having conservative ideals, represented Drake’s College Republicans. Michaela Newell from Intervarsity spoke about the hurtful rhetoric she sees in her church and offered perspectives on the health care reform as a pharmacy student. Pictured from left to right: panelists Michaela Newell, Kollin Crompton, Itzayanna Rubio, Phoebe Clark. The panel attracted a crowd that exceeded the initial set up in the Reading Room and CBS president Rai Ahmed-Green estimated there were around 65 people in attendance. CBS wrote several discussion questions for the moderator to read and gave the panelists up to fifteen minutes to share their own opinions and discuss the issue in front of the group. Topics included the administration’s rhetoric, health care and the affordable care act, activism and race. 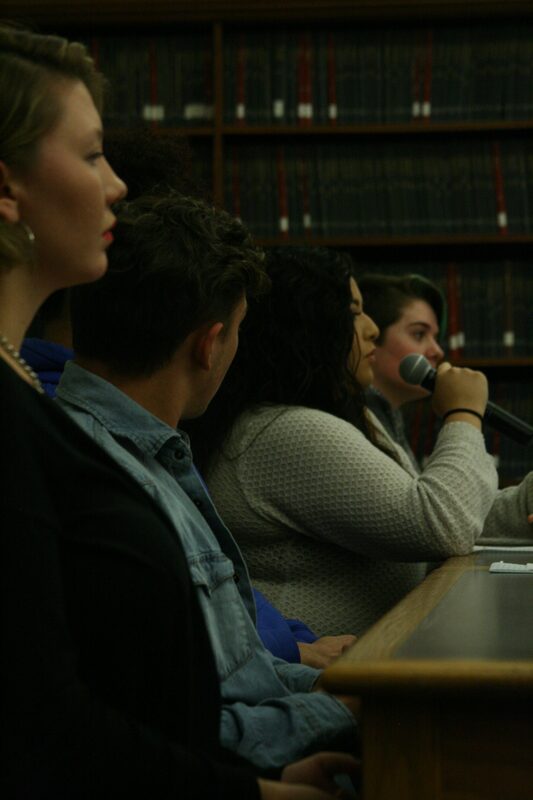 Despite the differences in ideologies and identities across the panel, the five students led a civil discussion with freedom to express their own opinions. Towards the end of the discussion, when one question prompted the students to share how their ideologies have changed, the students who were more conservative and right-leaning admitted to being uncertain about the current Republican administration and discussed how new branches of Democrats and Republicans seem to have emerged, making partisanship more difficult. Bulldog Testimonies: Living in 45’s America was held in the Reading Room in upper Cowles Library. The group did seem to be more left-leaning, with none of the panelists directly commending President Donald Trump and his administration, and the hottest issue was health care. Panelists cited their desire for “Medicaid for all” until the microphone reached Crompton. “Frankly, ‘Medicaid for all’ scares me,” he said. He explained that growing up in Nebraska, he lost his health care twice and worries that when he reaches retirement, the government will decide he’s no longer worth being saved. The panel concluded with a question and answer portion in which students from the audience were allowed to address other issues. The discussion was brought to an end with the focus on relevant issues in the country and on campus as well as the next steps moving forward.